Close encounters of the scary kind. I did not like this adventure at all... Why do these things always happen in the middle of the night? Ten days out from the Galapagos and my crew was into a well-established routine. The skipper usually makes an appearance at about 8am to relieve his mate, Judi, from the early morning watch; the fishing line is put out and within an hour a tuna or dorado is hauled in, which will be the day's lunch and dinner. Judi goes below and soon the aroma of fresh bread is drifting out to the cockpit. In the afternoon, the entertainment is the daily radio-check with my pal, Solitaire, about 100 miles ahead of us. Books are read until cocktail hour when the skipper doles out the small daily ration of rum or wine while they watch the sunset. I was happily sailing along downwind putting mile after mile under my keel as Bob and Judi had two headsails set up on my twin headstays with the windward one held out by a pole, while the mainsail was held down by a boomvang. Everything was peaceful and serene on board with the smoke and charred starter earlier in the trip almost forgotten. At night we could see the looms of large fishing fleets sweeping the oceans clean of fish with their nets, but they never seemed to be close enough to worry about. Funny, though, we never saw the boats during the day. Later that night, the skipper saw more looms, and they seemed to be brighter so, he alerted Judi when she came on watch. The wind had picked up and I was really enjoying sailing along at breakneck speed, when the first mate decided they should reef the sails. Oh darn! - there goes my fun, but I guess the comfort of my crew comes first. With headsails poled out and the boom vanged down, we were still making good speed. 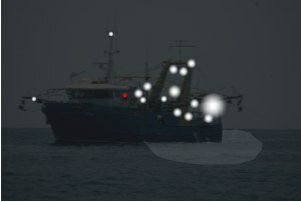 At about 4 am, Judi noticed the bright lights of a huge trawler off to windward and decided to call them on the VHF radio. She tried several times, but received no answer (those big fishing boats think they rule the seas and can be a bit arrogant at times.) It was very difficult to determine which direction the ship was heading, due to all their bright lights and because they were moving so slowly. So, even though we were trying to conserve battery power, Judi put all our lights on and shone lights on the sails to make our presence known. Still no answer from the ship and they continued on what now seemed a sure collision course with us, so she put out a frantic call to rouse the skipper. He also tried to call on the VHF, even in Spanish, to no avail. I was really worried now and was wondering when the hell they were going to do something, anything as I could hear the engines of that ship! They had a real dilemma facing them - if we headed-up, we would be sailing behind the ship where they were dragging nets, and we could not fall off, unless we jibed, as we where already sailing dead-downwind. Besides, either option would be difficult and time-consuming with all my sails held out. We would have started the engine, if we could have, to boost our speed to get away from this bully of the seas. With the ship getting closer and closer, the skipper took a drastic step; he shot a red flare across their bow. Boy!- that got their attention. That big bully altered course immediately and finally called us on the radio, but our battery power was too low then to answer and our handheld VHF batteries were flat. Without communication from us, they thought that we were in trouble and we had no way to tell them otherwise. They followed us for about 20 minutes before deciding that we were OK and I was so relieved to finally get away from them. Later, Bob made a comment that he should not have shot a red flare as that indicates an emergency (well, I thought it was an emergency as I was about to be run over); but that we did not have any white flares on aboard - an oversight on their part and they are usually so good about equipping me. The rest of the trip I was a bit nervous when we saw those looms at night, but they gradually went away and we had the seas to ourselves again - also, the fished returned. Insure batteries in handheld VHF radio are charged or that you have a spare. Make your decision to alter course early on - don't leave it to the last minute. (Initially, Judi thought that she could get across the bow of the ship with no problem) We recognize that the International Rules of the Road made us the give-way vessel since the ship was engaged in fishing, BUT, we were not sure what kind of ship it was until they were closer. If they had answered our call early on, we would have known that and taken action right away. We always ask ships what action they would like us to take first. Always carry a supply of white flares. Use radar (if you have one) to determine if you are on a collision course with another ship. We did have a radar, but were reluctant to use it as we did not want to totally deplete our battery power, but we should have. They are busy, perhaps with the nets. They don't want to be bothered.